The winter season is approaching again and for many that means struggling with cold and flu symptoms such as a sore throat. Often, doctors will suggest to a patient that they take ibuprofen to treat the pain and inflammation associated with having a sore throat. Now, questions are being asked about the wisdom of prescribing ibuprofen to treat a sore throat. A study, recently published in the British Medical Journal, showed that ibuprofen had no clear benefit for those trying to treat the symptoms associated with respiratory tract infections. The researchers gave patients with sore throats ibuprofen, a combination of ibuprofen and paracetamol, or steam inhalation. The trial included almost 900 patients who had visited their doctors complaining of sore throat symptoms. Paracetamol and ibuprofen, or the combination of these two drugs together, are the most common treatments prescribed for respiratory tract infections. The researchers have advised that doctors not prescribe ibuprofen, or ibuprofen and paracetamol together, to treat a patient who is diagnosed with having a sore throat as these drugs probably won’t work. Likewise, steam inhalation did not seem to offer any benefits in terms of symptom reduction. The researchers did mention, however, that some patients managed to suffer mild burns to the throat. The researchers noted one other disturbing trend when it came to taking ibuprofen. 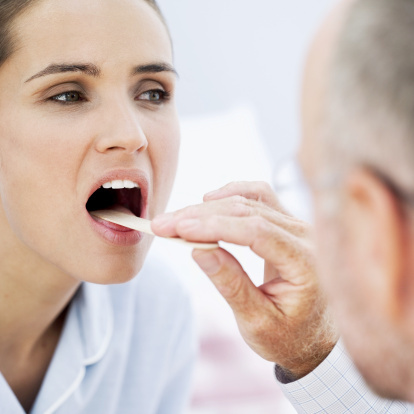 Patients were returning a month after being prescribed the drug without showing any improvements in their sore throat. In fact, many returned with worsening symptoms or entirely new symptoms. Over half of all the patients prescribed ibuprofen or ibuprofen and paracetamol did not improve and returned to seek further treatment for their sore throat. The researchers think that ibuprofen actually managed to contribute to the progression of the patients’ respiratory tract illnesses. Ibuprofen acts like an anti-inflammatory and may somehow be interfering with the immune system’s natural response to a sore throat. This interference causes the symptoms to linger much longer than they should, and even to progress. Ibuprofen works by blocking the production of various chemicals in the body. These chemicals include prostaglandins which your body releases when there is an injury or inflammation. Paracetamol works in a very different way. This drug blocks an enzyme found in both the brain and spinal cord. This enzyme helps to transmit pain signals. Ibuprofen has been successfully used to numb the pain and inflammation associated with arthritis. It can cause side effects in some people. These include stomach bleeding, allergic reactions and kidney damage. Anyone who is allergic to aspirin should not take ibuprofen. As for the researchers’ advisory not to take ibuprofen for respiratory tract infections, there were two exceptions: ibuprofen did show positive results in helping children with a sore throat and people with a chest infection seemed to benefit from taking ibuprofen. “Ibuprofen No Good in Treating Colds or Sore Throats,” Science Daily web site, Nov. 4, 2013; http://www.sciencedaily.com/releases/2013/11/131104101116.htm, last accessed Nov. 7, 2013. Little, P., et al., “Ibuprofen, paracetamol, and steam for patients with respiratory tract infections in primary care: pragmatic randomised factorial trial,” BMJ. October 25, 2013; 347: f6041.